You really can reach out and touch the clouds at Purisima Creek Redwoods Open Space Preserve. Then you can walk right through them. Hours: Dawn to a half-hour after sunset. Limitations: No dogs, no smoking. Driving directions: Take Highway 92 to Highway 35, go south for 4.5 miles to North Ridge parking area. Redwood Trail is two miles farther south. Western trail head is accessible from Higgins-Purisima Road at the southern edge of Half Moon Bay. Purisima is the jewel of the many excellent open-space preserves along Highway 35, Skyline Boulevard, on the westernmost slope of the Santa Cruz Mountains. Pacific Ocean breezes regulate temperatures in a just-right mix of not too cold in winter and not too hot in summer. Its trails often break out of a dense canopy of redwoods to present spectacular views of the coastline — if the coast isn’t fogged in. As spring turns to summer, fogged-in is the general state of things at Purisima, which guarantees a cool, moist respite from the valley’s heat. Depending on the whims of coastal winds, you can arrive at the main Skyline Boulevard parking lot under perfectly blue skies and find yourself passing through a ghostly mist within the first mile — the clouds are that close. The depths of the redwood forest here feel almost primeval, a remarkable sensation given that the forest is all new growth that sprouted in the years after early generations of loggers clear-cut the hillsides. Most of the park’s trail heads start high on the ridge, with trails diving steeply into the forest. Another site accessible from Half Moon Bay starts low along Purisima Creek and climbs high into the park — my favorite starting point, despite limited parking. Standard precautions: Take a light, water-resistant jacket to keep moisture falling from the tree canopy from soaking you. Hikes down from the ridges are pretty steep — save some strength for the return trip. Poison oak is common but less of a worry on the many wide trails. Watch out for mountain bikes. Easy: The Higgins-Purisima trail head from Half Moon Bay leads to a wide, gently sloping path that follows the Purisima Creek through the redwoods for a mile and a half before the trail climbs steeply toward Skyline Boulevard. It’s one of the best easy hikes in the area, assuming parking is available. Redwood Trail near the southern Skyline Boulevard trail head is pretty but noisy, thanks to the motor-psychos rip-roaring down the scenic drive. 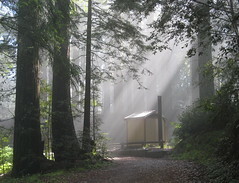 Moderate: The 2.6-mile Soda Gulch Trail is a peaceful single track threading through a cathedral of young redwoods. An essential trail to check out, but at least a couple of miles from the nearest trail heads. Hard: Any hike down to Purisima Creek Trail from the trail heads on the high ridges will be a leg burner on the way back up. Worth the effort if you’re a strong hiker, because the creek trail tracks through a luscious stretch of forest.